Children’s rooms can be a real problem. Firstly… children grow! You begin with a room for the baby, but soon it needs to adapt to a little person with completely different needs and eventually a child who builds up their own collection of toys and clothes. Suddenly the room isn’t big enough, or the wardrobe isn’t able to store all the clothes and there’s no other space in the house for them, every cupboard and draw is full and don’t even look under the bed! But there are ways to make the most of the space you have and add storage items that don’t take up too much room. The key is to keep everything in proportion. People are often asking us about storage solutions for children… especially Children’s Clothes Rails. So let’s start there. Indeed you may not have the space for a large Garment Rail in their room and with the size of childrens’ clothes you don’t need it. 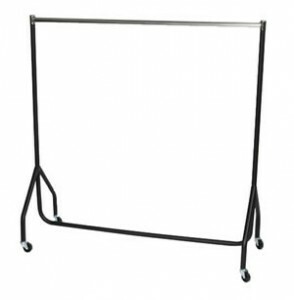 The 4ft Junior Height Black with Chrome Top Garment Rail is more than sufficient, plus takes up less space in the room. 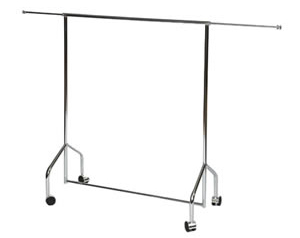 This high quality clothes rail measures 48″ (122cm) in height and 48″ (122cm) in width. The tube measures 1″ (25mm) in diameter and the castors 2″ (5mm). These rails are ideal for children’s clothes, or indeed also for separates and smaller items. They are sold singly, and in twos or threes for added value. If you are looking for a truly adaptable rail that will grow with your child you should check out the Adjustable Width All Chrome Mini Rail because it extends in Width to 4ft 8′ of Hanging Space. 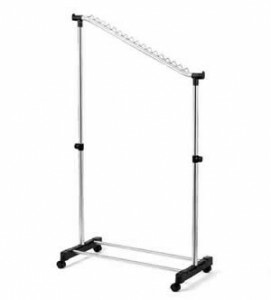 This strong All Chrome Mini Garment Rail on casters (4cm diameter) has pull out arms to give 56″ (142cms) of Hanging Space. The height is 40″ or 102 cms and the length is 32″ with an arm at either side of 12″ each. It’s quick to assemble (supplied in 8 parts). It is lightweight and flat packed. Perhaps like myself you had to extend, convert the loft or change the layout of your existing bedrooms to make room for a new arrival and now you need a rail to fit. Having gone into the eaves of my own house for just this reason I know about awkward spaces, and the Understairs Garment Rail is perfect for awkward storage spaces! The Rail is lightweight and height adjustable. Made of quality stainless steel and fitted with casters so you can easily move it around. Check out the following dimensions to see if it could solve your problems! I would recommend this product, as it’s good and substantial. Would also recommend Caraselle for their prompt delivery and their after sales service is excellent. So you don’t need to compromise and get a Rail that is too big or just doesn’t fit into an awkward space, instead get a Children’s Clothes Rail or Angled Rail to do the job properly! For more ideas on what to do about gaining extra space for all those extra clothes and toys keep an eye out on Children’s Storage Ideas next week… and don’t forget we have a new addition to our large range of Garment Rails with the Shocking Pink 3ft Bespoke Custom Coated Pink Garment Rail – so something for you too!